White vapor and black smoke. From CSB report. 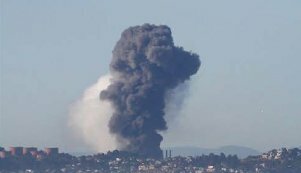 On August 6, 2012 a leaking pipe at the Chevron refinery in Richmond, CA led to a fire that shut down a crude oil distillation unit and caused over 15,000 people to report to local hospitals seeking treatment for respiratory and other health issues. This was not a Texas City. About 20 of the 15,000 people were admitted to local hospitals and there were some minor injuries to employees in the area of the fire but no fatalities. However, it should be a wake-up call for Chevron. Chevron's incident investigation, including a root cause analysis, resulted in multiple corrective actions that will ring familiar to our readers. Summarized, they are: look harder for corrosion; upgrade the hardware reliability program and supporting procedures; increase oversight and training; implement new rules for evaluating leaks; and emphasize the importance of process safety in decision making. In even fewer words, tweak the system and retrain. There is no mention of safety culture (SC) but the odor of a weak or compromised SC wafts from the report. In a strong SC, the 2002 inspector would have identified the potential problem, documented it in the corrective action program and monitored progress until the issue was resolved. The corrective action program would have evaluated, prioritized and resourced the problem's resolution consistent with its safety significance. Outside experience and directives (from other Chevron entities or elsewhere) would have been regularly integrated into local operating practices, including inspection, maintenance and process procedures. We'll see if Chevron gets the hint. * CUSA Richmond Investigation Team, “Richmond Refinery 4 Crude Unit Incident August 6, 2012” (April 12, 2013). Attachment to letter from S. Wildman (Chevron) to R.L. Sawyer (Contra Costa County Health Services), “Seventh Update to the 30-Day Report for the CWS Level 3 Event of August 6, 2012” (April 12, 2013). U.S. Chemical Safety and Hazard Investigation Board, “Interim Investigation Report Chevron Richmond Refinery Fire” (April 15, 2013). In addition to Chevron, the CSB also criticizes regulatory and other government agencies, particularly Cal/OSHA, for shortcomings in their oversight of refinery activities. ** J. Van Derbeken, “Chevron ignored risk in '11, workers say” sfgate.com (Oct. 13, 2012). *** J. Van Derbeken, “Chevron fire report shows troubled history” sfgate.com (April 13, 2013). **** J. Van Derbeken, “Chevron fire sign of weak oversight” sfgate.com (April 15, 2013). A New Sheriff Coming to DOE?